Ahh, White Guilt. You think regular guilt over something you actually did is a self-destructive unproductive spiral of masturbatory misery, just wait 'til you try feeling it for something your great-great-grandfather did, that you're going to benefit from in indisputable but unquantifiable ways for the rest of your life! Seriously, though, unless it motivated you to go donate to the NAACP, nobody gives a damn what you felt like after seeing 42. Shut up already about White Guilt. JH: Oh! Is that for us? We weren't speeding, were we? WW: No, no we weren't. I do believe you are about to experience a DWB, my friend. 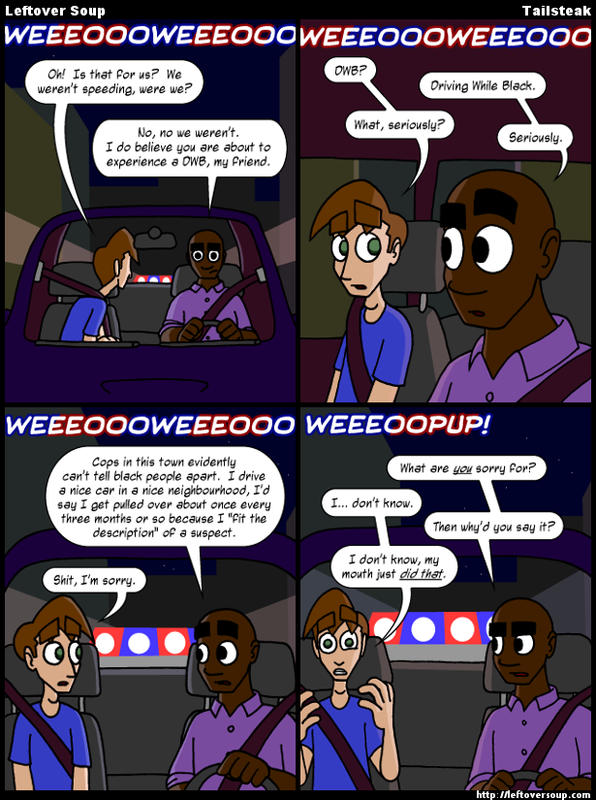 WW: Cops in this town evidently can't tell black people apart. I drive a nice car in a nice neighbourhood, I'd say I get pulled over about once every three months or so because I "fit the description" of a suspect. WW: What are you sorry for? WW: Then why'd you say it? JH: I don't know, my mouth just did that.